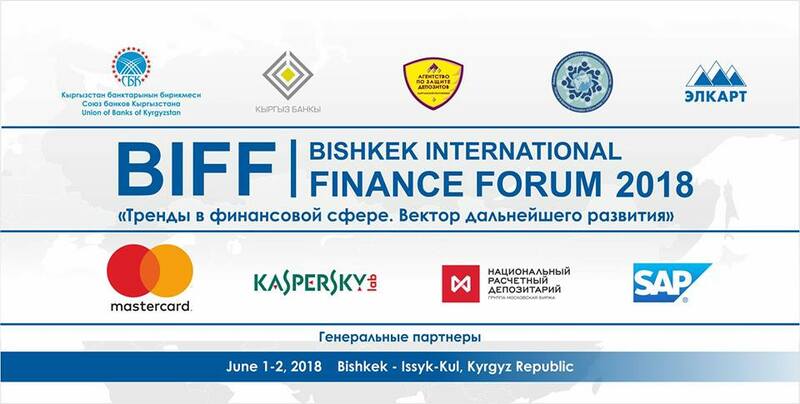 Welcome to the Bishkek International Financial Forum 2018, which will be held on June 1 and 2, 2018. (Details of the conditions of participation are shown below). and other issues related to the prospects for the development of the banking market. “Bishkek International Financial Forum” is an annual large-scale business event, which is an optimal platform for the exchange of views, discussion of the latest trends in the financial sector, offering ready-made solutions and services, announcing already begun projects, finding partners in the Kyrgyz Republic and other countries. We invite representatives of commercial banks, microfinance companies, payment organizations, telecom operators, government agencies, international organizations, companies that have relationships with financial institutions, and media representatives and experts are also invited. The cost of participation in the first day of the forum is 1 000 som (Plenary session and sectional discussion). Participation for representatives of the National Bank of the Kyrgyz Republic, commercial banks and microfinance companies, etc., who are members of the Union of Banks of Kyrgyzstan, the Deposit Protection Agency of the Kyrgyz Republic, Government bodies, Forum Partners and representatives of the media are FREE. To register for the forum, you need to fill out the registration form on the forum’s website – www.biff.kg, after which you will be sent a confirmation of registration and the conditions for participation. Representatives of financial and credit institutions and business community of the republic and foreign countries, heads of financial and credit institutions, telecom operators, experts, representatives of companies providing equipment and IT solutions, foreign guests with experience in introducing new financial products and many other persons . Representatives of Sberbank, VTB Bank, Alfa Bank, Transcapitalbank, as well as MasterCard, SAP company, the Coordinating Council of the Eurasian Center and many other financial institutions and IT companies will deliver presentations on the forthcoming forum in the section devoted to the issues of new banking services and non-cash payments. and the development of mobile and remote banking services. On the subject of cyber security with coverage of current trends, existing threats and forecasts, will be representatives of Kaspersky Lab, National Settlement Depository, Interbank Processing Center, Baker Tilly Bishkek, etc. Representatives of the Organization for Economic Co-operation and Development, International Finance Corporation, Institute for Sustainable Development of Finance of the Kyrgyz Republic will speak in the section devoted to the issues of green economy and sustainable financing, which will discuss the green investment program, the implementation of the road map, the introduction of green technologies, the involvement of the Kyrgyz banking sector in the global a network for sustainable financing, the development of new financial instruments / platforms based on the principles of sustainable fin nsirovaniya to attract long-term and relatively cheap resources, and so. All these and other issues will be discussed at the upcoming Bishkek International Financial Forum – BIFF2018, June 1 in Bishkek and June 2 at Lake Baikal. Issyk-Kul. This year the event is timed to the 25th anniversary of the introduction of the national currency – som and the 10th anniversary of the Deposit Protection Agency of the Kyrgyz Republic. General partners of the forum: MasterCard, Kaspersky Lab, SAP Company and National Settlement Depository (NSD). The organizers of this large-scale financial event of the year are the Union of Banks of Kyrgyzstan and the National Bank of the Kyrgyz Republic, co-organizers are the Deposit Protection Agency of the Kyrgyz Republic, the Interbank Processing Center and the Euro-Asian Cooperation Financial and Banking Association. The number of participants from commercial banks, microfinance companies that are members of the Union of Banks of Kyrgyzstan and other partner companies is unlimited. We hope to see from you representative delegations at the plenary session of the forum and on the panel discussions of the first day of the forum, as well as seeing top management of financial institutions on the second day of the forum.